Crazy and beautiful, our Hunter Thompson Shirt is a must have for your collection. "The decision to flee came suddenly." Fans of the film "Fear and Loathing in Las Vegas" will remember the scene in the movie where our hero is trying to escape from paying his outrageous hotel bill. This is a hilarous and wild Hunter Thompson shirt with deep reds and grungy lettering with crazy swirls and a manic Thompson illustration finishes it off beautifully. Our Hunter Thompson shirt looks great on both light and dark shirts and we have loads of them available in all sorts of cool styles. We have Hunter Thompson shirts available in men's, women's and kids styles too. 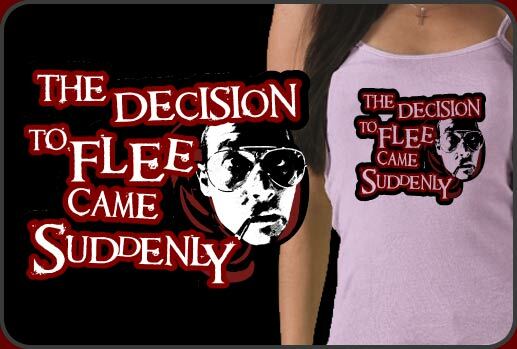 Hunter Thompson Shirt for fans of the legendary Father of Gonzo Journalism.